Are you a business in the Duquesne Light Territory? Are you still using inefficient bulbs to light your facility? Are you interested in saving money? 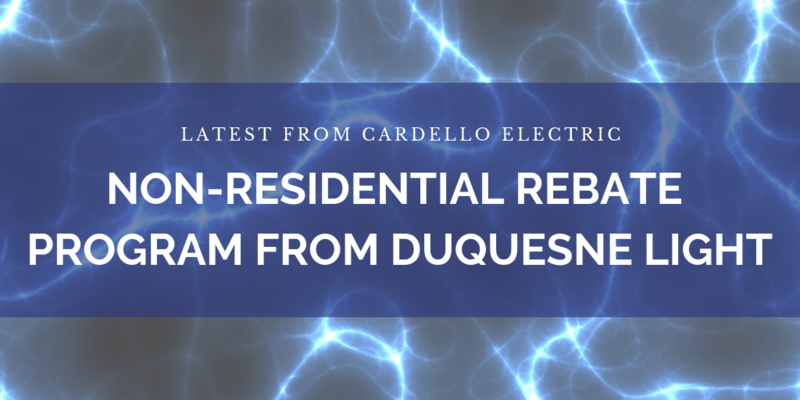 If you answered yes to these questions, read on to learn more about the Duquesne Light Non-Residential Rebate Program. We get it, nobody likes change. But what if that change would save you time and money on both maintenance and energy costs? And what if this change cost a whole lot less than you’re estimating it to be? Maybe change isn’t so bad after all. According to Duquesne Light, most businesses waste about 30% of the energy they pay for. Inefficient lighting like incandescent & halogen bulbs play a key role in the waste. Making the switch to energy-efficient bulbs could help you reduce your lighting related energy costs by up to 90%. Duquesne Light’s Commercial Lighting Program has partnered with participating distributors, like Cardello to offer your business instant discounts on qualifying ENERGY STAR® LED bulbs. These bulbs last up to 25x longer than incandescents and cost nearly the same. Duquesne Light wants your business to participate so they are making this process as easy as it can be. No rebate forms or lengthy applications are required! Ready to make the switch? Visit you local Cardello Electric Supply & Lighting to learn more! Have questions on this topic or something else? Reach out to us with your questions and we will get back to you, you may even make it on our next blog post!